Last week we reported on a PBS Frontline program showing that a 2 percent mutual fund management fee can gobble up two-thirds of your nest egg for retirement over a span of 50 years of saving. Now comes an equally ugly truth. Since at least 1998 the U.S. Department of Labor, which oversees the nation’s 401(k) plans, has known that fee gouging was eroding the ability of workers to adequately build wealth for retirement in 401(k) plans. It took more than a decade for the Federal agency to pass a regulation mandating that 401(k) recipients receive fee disclosure in an annual mailing. Leading the charge against full disclosure was a coalition of trade associations dominated by Wall Street. 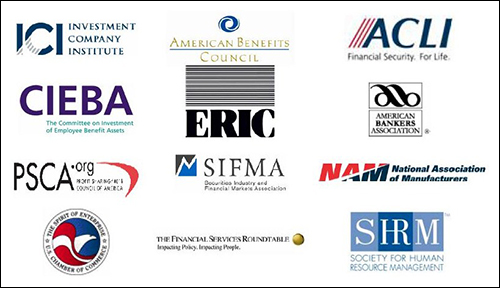 Back in 2007, when the Department of Labor put out for public comment its proposed rules on making fuller and clearer disclosures on 401(k) fees, a swat team of Wall Street related trade associations organized together to beat back too much disclosure. Noteworthy among the members was the infamous U.S. Chamber of Commerce, the Financial Services Roundtable and the Securities Industry and Financial Markets Association (SIFMA). The trade coalition produced no surveys, no research to back up the proposition that keeping 401(k) participants blissfully ignorant of grainy fee details was in their best interests. In fact, the preposterous idea that investors already had adequate information or that “more disclosure will not always be better” was discredited in a February 2011 study conducted on behalf of AARP. Titled “401(k) Participants’ Awareness and Understanding of Fees,” the report found that seven in ten (71percent) participants were not aware that they pay fees to their 401(k) plan provider. When participants were told there were fees, 62 percent did not know the amount of fees they pay. Beginning last August, 72 million participants holding some $3 trillion in 401(k) assets were to begin receiving an annual statement of the fees they are being charged. The statements for assets with a varying return (such as stock, bond and money market mutual funds) are to show the total annual operating expenses expressed as both a percentage of assets and a dollar amount for each $1,000 invested. In addition, commissions, front end and back end sales loads, surrender charges, account fees were also to be spelled out. For investment options that have a fixed rate of return (such as fixed-rate annuities), information was to be provided on any shareholder-type fees or restrictions on the ability to purchase or withdraw from the investment.